political / economic language saturates our daily lives but it is our choice whether we speak it or not. It is a language of shares, investments, insurance, security, profit and loss leading to winners and losers. Words make stories in which everything is a commodity, measured in terms of productivity progress and usefulness. A language that denies Nature Feelings the Earth and Love. The orchestra is playing. It began at dawn with great open bellied laughing, then slightly more melodic tunes ,peeps whistles whips and trills until it is riotous in the sweetest possible way. The songs continue as I drink my pot of tea, eat toast, follow me as I meditate, dress, sweep the kitchen floor , brightly busily slowly, tuned in to the day they chirp cheep chatter and warble. This symphony is full of purpose expressing vital news marking the patterns of their lives of the Forest around them; sunrise, egg hatching, a flowering, a seeding, storm alerts, approaching snake goanna human, matings, deaths, sunset, all is jotted in the Forest ledger, all a note played in the orchestra of Birdom. Everywhere wrens honeyeaters magpies thrushes pigeons tawny frogmouths, skinks wombats wallabies and bandicoots are communicating the Radiance of Life on Earth. Thunder cracks open the swollen skies, runs away over to the Mountain and races back again. I am lying on the couch reading when the thunder and lightning Beings skip into the room whip crackling the air, chuck a bright flare of light and startle me. Rain has a huge vocabulary, a vast repertoire of moods sounds and feelings . There is the song for splashing, for plopping fat drops, tapping on window panes, a pelting drumbeat on the iron roof, a windy slapping against the tree trunks and a gushing gurgling rushing flooding along creeks tracks and drains. Some days it broods far above, squatting on the Mountain wearing a grey beret. Cloud mist drifts around inviting the faintest speck of moisture on the cheek. Other days rain scarpers out to sea with barely a backward glance, where it visits Mother Ocean and shares a cuppa. In its own sweet time it returns to the valley rejuvenated committed to the business at hand and delivers a soft shower or a teeming heavy pelting drama. Why would we think that Water is not cognizant, that Earth is not aware, that Air is not tuned in, that Fire does not know us? We are forged from the Elements , related to every drop, every breath, every molecule. There is a Song for the ghost mushroom, the elder flower, pittosporum , titree, lavender of scent and beauty , bee foraging , bioluminescence ,oils and medicine. I inhale , take them into my body – a draught of pure sun drenched essence Sings in me. The dialect of frogs – croaks cricks stutters bonks hops and leaps in communication with Earth and reed, Water and soft mud, hibernation dreaming, forecasters of rain and water quality. The ripe summer peach is a rich feltness in my mouth, dribbles along my fingers and chin singing of tree limb and bough, of bud blossoms leaves fruit and birds nests, sun, rain, wind and days measured in ripeness and angles of the sun and spiders that weave between branches , worms burrowing in the roots and squealing children that swing up on branches and chuck pips at each other . Hard working ants push up the soil – a drainage technique for them that informs me rain is coming. Every Being has language, every Being shares their Story . Stop ! listen and learn a language older than the stock market, older than open cut mines, older then human intervention. This language of Nature, of Life is ancient, a lineage that holds Creation in its Song. One day we entered the story inventing our words / myths around the camp fire, Songs of respect and awe, humility and gratitude until we dug up the uranium, clearfelled the forests and greedy gobbled dry the rivers. It was then we changed the words to deny Beauty . It was then we allowed fork tongue speak of rational logic to lock out the weeds and sunflowers that nod as you walk past, the cloud that stoops to peer in through the window, the dripping tap in the kitchen saying hey I am Water, we are Kin. It was then a Forest became a compartment and the share price of google was more important than the River the Platypus and the Child. Now we are going forward determining outcomes while the Raven sits on the wire, keen eye piercing , aaahh aaahhh aaahhh. Probably time to embrace the full embodied experience of connection, time to learn the language of the Heart that communicates with all Beings. if the tree falls in the forest does anyone hear ? Yes I do , I hear it fall. Indeed I spent months some years ago in close proximity to the dismantling of a forest – smash crash and truck it away– hundreds of years of growth destroyed. Once upon a time I lived on a blockade at the foot of Wandella Mountain. I am sure I had other things to do at the time and yet nothing seemed more important than bearing witness to the demise of a beautiful forest. It is true that at first we hoped we could stop ‘them’ that they could become aware that what they were doing was madness, unwarranted and harmful to all life on this planet. Instead we watched our kin destroyed as state forestry with their big yellow machines, hard hats, fluoro vests and chainsaws cut down the eucalypts to feed the wood chip mill. The sweet water of Paddy’s creek riffling under the pinkwoods, lilypillies, vines and myrtles were a visceral remnant of the ancient Gondwanaland rainforest. Even this remarkable pedigree held no sway in the office of cuts, yields and quotas. To assume that the rainforest gullies, the brave canopy, the chortling streams could survive the assault on their cousins nearby was an insult to those with intelligence. For years now state forests have not been healthy ecosystems. They lack diversity for starters, they lack habitat, and they lack life. From the highway it looks green and treed in the distance but in truth they are green hills of illusion that have spelt doom for the soft padded, the clawed and the feathered ones. They are so bereft of life that they cannot be truly named forest. I know this because I have walked this land; I have watched the logging aka the clear felling, discussed and argued in an attempt to understand. I walked before logging and after, before they were hazard reduced by fire and after. I noticed the tracks of the wild disappear. I noticed the sound of vitality diminish. Once upon a time I heard the Song of the Dingoes, now no more. Living in this forest, home of the faerie embassy, small in forestry terms, huge in diversity, rich in habitat, lush with footprint, with feathered and clawed and soft padded ones, has opened my eyes ears heart and mind. Through the lens of forest under the tall canopy in the shaded groves and sunlit ridges I listen to the Voices, the Song, the Murmur of Life Becoming Forest. I am the watcher, the guardian, that which listens and reaches out to awaken ……. The spider’s web, flying seeds, galloping vines, extruding saps, sweet berries, bush tucker and medicines –anti-biotic, anti-inflammatory, anti-viral, anti-bacterial – a rich pharmacopeia lives within reach. The expired wood cut and gathered into the house drifts blue wisps of smoke out the chimney, a meal is cooked, the kettle boils, the water is heated, the home is warmed, the bread is baked. The orchard swallowtail butterflies are tippling in the garden, little fella wallaby’s now young adults come in to drink from the pot of water. Mothers hold the next generation in their ample pouches. Last weekend Kingston John and I went looking for a staff for him and spotted several St Andrews X Spiders spread eagled within their webs. The shrill alert of the kingfisher told us that goanna was on the move. Sometimes for no discernible reason a tree falls, in total stillness it will plunge from its great height to the ground. I go looking and come across its majestic grace nestling its trunk on the ground, roots offering hollows for habitation. Somewhere inside of each of us we are aware of the felling of the forests, the poisoning of the land, the defiling of the waters, the violence enacted against each other. We cannot separate from our brethren, we can only pretend to. We cannot ignore the injustice done in our name we can only pretend to. But, we can enable each other to act, planting seeds of healing into the ground, into our hearts. We can notice the beauty offered to us by Mother Nature, we can show gratitude and offer sips of water in return, a little compost, a song, a listening, a story. I sit in the smell of hot summer and rain coming, of damp rising and wind from oceans that circle the globe and the wild wispy seed pods flying hither and thither keen to fly, keen to begin life all over again. I can learn from this effervescence of life this keenness to Be. Red belly black snake emerges from under the veranda takes the time to warm up and disappears in the long grass. The native apple berries are ripening on the vine and a water skink is basking on the couch in a patch of sunlight. In this forest free from the states intention life flourishes going about its busyness. For this I am grateful. 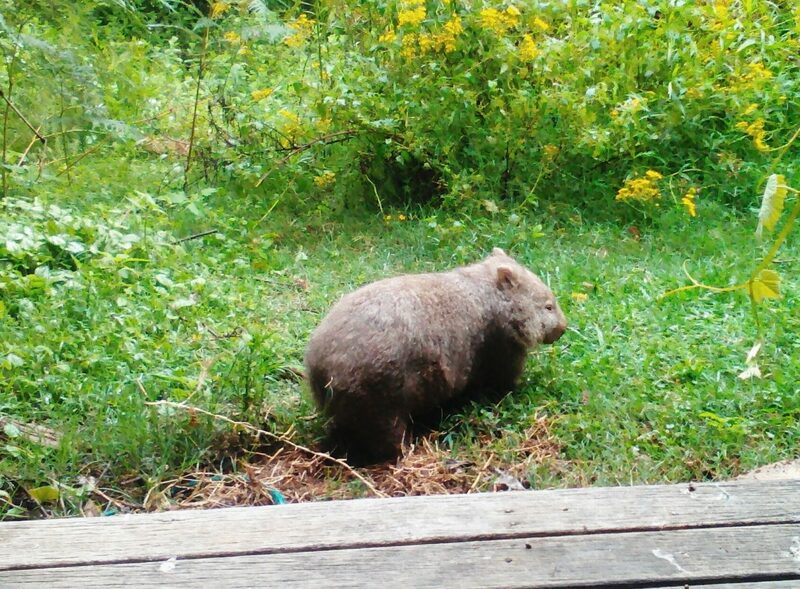 Somewhere deep in the Earth wombat sleeps. I dream too, that the machines fall silent , the birds are Heard and we learn how to Live and Respect one with another. is qualified but cannot be quantified. and slips inside impossible situations. love is a feeling though no one is quite sure where it lives. stuffing her pockets with laughter and light. and a willingness to give all that we are. love is truth and truth is not the opposite of lies. are shattered in its quiet brilliance. in the moment it could be any and all of these things.